How about we show the whole quote? Thor suckerpunched Odin in the face? And Odin was hurt far worse than Darkseid was. He was on his knees and hands for a full page. Only by depriving Thor of mjolnir. With mjolnir Thor beats down Odin in one shot. By your own logic man.". By the logic Darkseid was getting stalemated by Justice League, Thor beats down Odin too. That was my whole point. There are so many problems with all of your misleading statements above, I don't know where to begin. Suffice to say, the context about Wonder Woman, not Darkseid (note that the original thread title is "Darkseid vs Wonder Woman: WW 36 spoilers"), and even your own quote says that Odin only beats Thor by depriving him of Mjolnir and with Mjolnir, Thor beats Odin. So you still have no credibility. No, if you are on your knees after just one hammer shot from Thor, you are a weakling. Doubling down on stupidity just makes you look doubly stupid. It's your logic man. You can tell it whatever you want. That line doesn't even make sense. Read all the above quotes to understand why it makes no sense. I didn't make some stupid rule about being a weakling just because someone fell down on their hands and knees. You did. It's not my logic. It's yours. You should. You started it after all. No, the knee defense is yours and yours alone, dude. 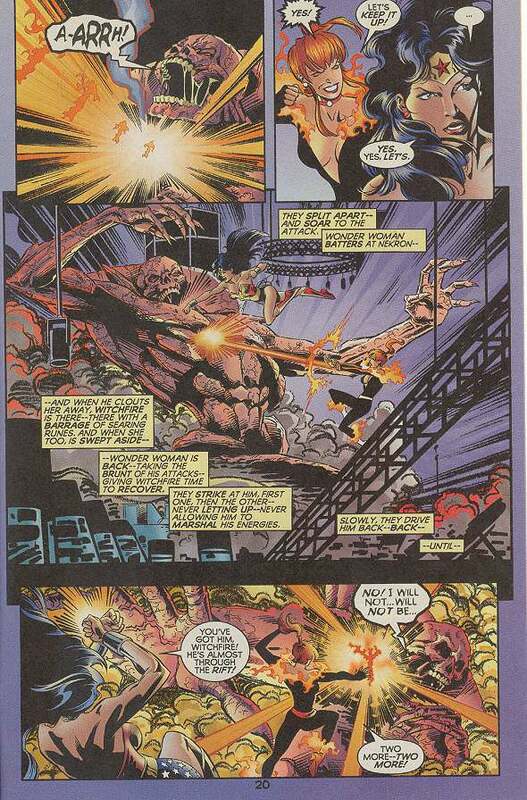 You didn't start "Darkseid was getting stalemated by League because he was blinded"? Being blinded and being on your knees are two completely different things. You're the one arguing that being on your knees is worse than getting blinded, which is absurd. Are you in kindergarten? 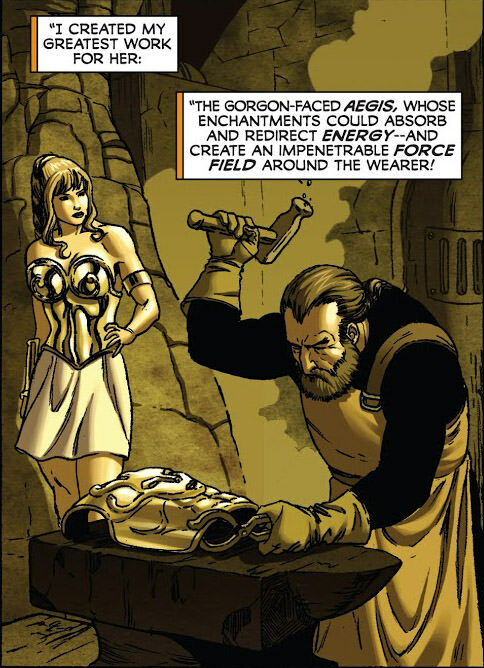 Aegis only gave the wearer to redirect kinetic energy. Not all energies. You see it redirect Zeus's lightning on to Hera, killing her! It also supplies an impenetrable force field. Typhon doesn't normally have either ability so it's a significant power up. And we straight up were informed that it only redirected kinetic energy. No. I already showed you where the comic states it does more than that. Here is the scan yet again. Funny how in this very thread you state, "We go by what's on panel, not what most people think." This is what's on panel, but you're going by what you think instead. Your hypocrisy never ends. You're just pitiful at this point. Zeus wasn't human or less powerful. What's that about going with what's on the panel? Here is what's on the panel: "human child." 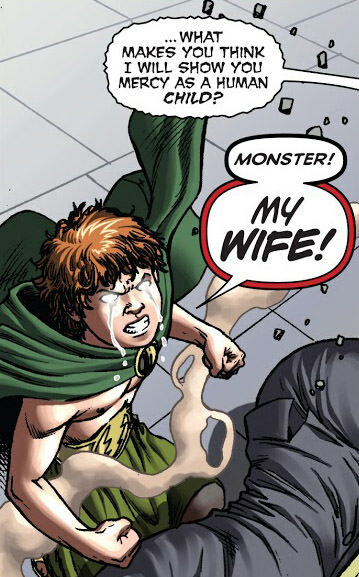 And he was an amnesiac human child with no experience with his powers. Of course that makes him less powerful. Who is more powerful, someone with thousands of years of experience with those powers or someone who has no experience with those powers? Because it is? And when Thanatos comes to collect their souls, they were shown as adults. That has nothing to do with Zeus being an amnesiac human child at the time before his death. I already posted all the scans between the time Hera explicitly stated Zeus had amnesia right up to the point before Typhon killed him and at no point in the comics did anything happen that would give Zeus back his memories. I never admitted any such thing kiddo. You're just making things up once more. You have no credibility because you deny what's right there on panel while demanding that what's on the panel be the only evidence. Wrong on all accounts. Zeus wasn't a human child, he was still a God. I already disproved that with the scan above. What scan? Here is Hercules teaching Zeus to see things as a God. That Hercules has to teach Zeus how to use his own powers makes my case for me. Zeus has his power, but he is in the body of a human amnesiac child. It's stated right on panel in the scan I posted above. You already admitted you were trying to be misleading with this example, but once I stated using this example as undermining your credibility, you try to walk it back, but your disingenuousness is plain for everyone to see. For you to pretend that the amnesiac human child Zeus is equivalent to the adult Zeus with all his memories is absurd. You actually don't know how Typhon killed child Zeus because it happens off panel, but we saw the Aegis deflect Zeus' lightning, so already that's the Aegis helping Typhon kill Zeus in that it gives him defense against all of Zeus' energy projection. It also redirects physical blows as it did to Hercules, so it also blocks all of Zeus' physical attacks. Because Zeus wasn't having his head blow up like Hera and was shown dead physically. That sentence makes no sense. Hera's head getting blown up is her being shown dead physically. and Hercules physically killed Typhon by bashing his head in after giving him amnesia. The key point being "after giving him amnesia"! Without that happening, Hercules was going to lose. Hercules was all but beaten until he used the water of Lethe. So you said I was all wrong, but I was all right. Yes, the river only gave him amnesia. Hercules killed him physically when Zeus couldn't. The waters of Lethe made Typhon forget he had the Aegis so he didn't use it. Just moments earlier, Hercules tried to club Typhon and the Aegis reversed the blow, injuring Hercules severely. Will your attempts to mislead never end? So Zeus is top tier, eh? Normal Zeus is. Of course your choice to use a human child amnesiac Zeus as an example is misleading. Your choice to pretend Typhon was normal Typhon when he was powered up with the Aegis is misleading. Your choice to pretend Hercules beat Typhon with his own power is misleading. Of course you admitted you were being misleading on purpose here too. So you have no credibility. Have you tried googling it? I've heard it's quite useful. So you can't explain it. I thought so. Or perhaps I'm simply mocking you. So you admit to violating board rules? So you admit to having no class? Argumentum ad hominem usually arises when you failed in every other respect. You're quite transparent in your hate about DC characters. How is that being confused? I'm not the one responding to my own insults as if I directed them at myself. So the confusion is all on you. You aren't? Are you sure? Because you are obviously chanting "credibility" when you have none whatsoever. Really? How am I not credible? I'm not the one contradicting myself left and right. I'm not the one using misleading examples. I'm not the one using one standard against Marvel characters and the same standard in support of DC characters. You're unbiased? Don't make me laugh. You're the biggest Odin and marvel fanboy here. Then you haven't met Oliva. I have. He is harmless. Wait until you read his racist quotes. Nekron is a legitimate death abstract. You might as well call Presence a skyfather level character in your marvel zeal. Nekron has only recently been written that way under Johns. He wasn't always that way. Watch Wonder Woman and an inexperienced Witchfire beat your DC abstract! He was always written that way. 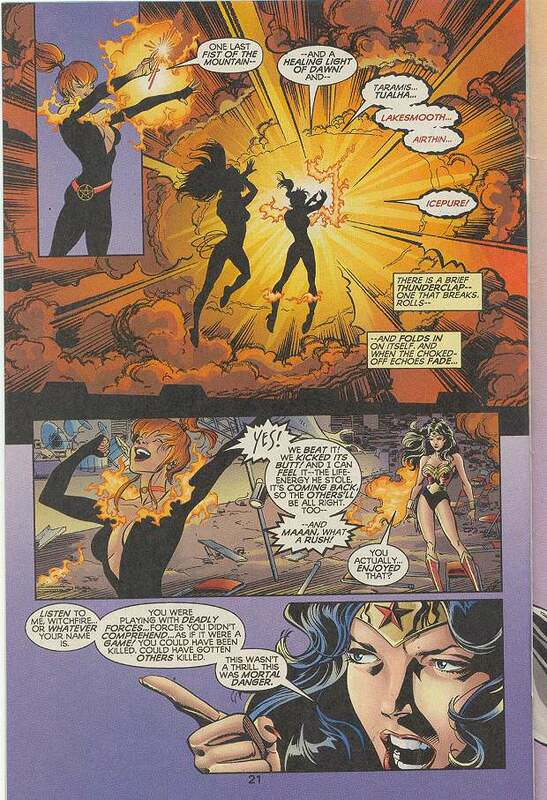 Then I guess DC abstracts aren't very powerful if they can get overpowered by Wonder Woman and an inexperienced Witchfire. Note that this isn't my stance. It's your claim that Nekron has always been written at abstract power level and yet can be beaten by Wonder Woman and Witchfire. That doesn't say Odin is more powerful than Spectre. I gave Spectre a range whose average is 120 compared to Odin's 85. I said that Spectre is usually on the lower end of that range. I didn't specify in that post but by lower than 120, I meant around 100, which is still greater than 85. You're back peddling straight up? You said he averages towards 40 in your own quote man. Lower range is between 40 and 120. You interpreted that as 40. I did not. As these are my thoughts, I know better than you my beliefs. I'm not sure what you are talking about here. Are you really this desperate? So you deny that you posted on these Alvaro boards before as Abhijit? Are you a moderator all of a sudden? What's the reason for this? You're refusal to answer the question answers the question.